Update 2017: The National SMS Toll Free Number Database released the new toll free prefix 855 in 2011. Now your small business can get an 855 number and use it as your business’s main toll free number. Toll Free 855 phone numbers work the same way as all other toll free numbers do and because 855 numbers are newer than traditional 800 numbers, you are more likely to find a vanity 855 toll free number available that spells the word you want for marketing purposes. You can use our custom toll free number search toll to instantly find available 855 toll free vanity numbers. Even President Obama used an 855 toll free number: (855)-85-OBAMA. Why get an 855 number? An 855 toll free number is portable meaning you are the owner and you can transfer it from provider to provider. Toll free 855 numbers are relatively new so you are more likely to find an available custom vanity 855 phone number. 855 phone numbers have never been recycled or used by another company, so you won’t have to worry about getting unwanted calls from people looking for the company that previously used that business toll free number. There’s no difference between 855 numbers and other toll free numbers. An 855 toll free phone number is one of the newer toll free number prefixes released by the FCC. It works the same way as other toll free numbers, 800, 888, 877, and 866 etc. 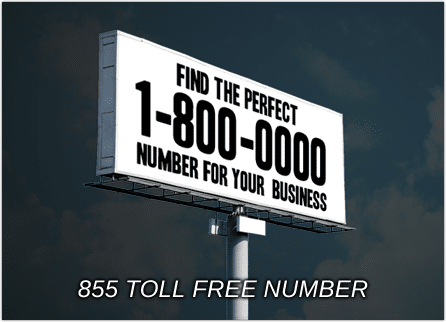 A toll free 855 number can give your business the same credibility and nationwide presence as any other toll free number prefix. It’s easier to get an 855 vanity number than an 800 number. Because 855 numbers were released in 2011 compared to 800 numbers which were released in 1964, there are a lot more 855 toll free numbers available. Most 800 numbers have already been snapped up by other companies. However – UniTel Voice has access to thousands of toll free numbers in every prefix. 855 numbers have the same portability protection as 1-800 numbers. 55 numbers enjoy the same portability protections as all toll free numbers. Portability means you own the number and can port it to any phone company of your choice. Unlike local numbers, toll free number have special rules put into place by the FCC that protects businesses from issues related to service interruption and phone number ownership.